You did not understand that? Neither did I. The heart of successful monetary policy is a coherent monetary policy framework. There should be clarity on objectives, instruments and operating procedure. Other than the 1999-2006 period, where we roughly achieved the goal of y-o-y CPI inflation from 4 to 5 per cent, there has been failure all through. One factor which is holding back high growth in India today is the immense uncertainty about the future. What will happen to inflation and interest rates? Nobody knows, and this hurts confidence. There is a short-sighted view which suggests we should tolerate high inflation. But low inflation is a growth fundamental. Matters have been made worse by the recent fight about the rupee [link, link]. An array of harmful measures were taken, which have muddied the waters considerably. The RBI operating procedure was shattered by these moves. India now has the silliest monetary policy framework in the world where the central bank engages in monetary policy through changes in 8 numbers: (1) The repo rate (2) The MSF / Bank rate (3) CRR (4) Reverse repo rate (5) LAF window cap (6) MSF window cap (7) Minimum CRR to be maintained (8) SLR. In addition, they also mess with capital controls. A variety of objectives are in the fray including WPI, CPI, GDP growth, the exchange rate, exchange rate volatility, and then some. So RBI is supposed to chase 6 objectives using 9 instruments. were optimistic about what might arise in his work on monetary policy. What is required is clarifying objectives, instruments and the operating procedure. RBI now has an unruly menagerie of objectives and instruments. This situation has generated heightened uncertainty which is hurting the economy. We got into this tangled mess because of the fear of QE withdrawal and the currency fight of recent months. We recognise that this is a mess. Now that this fear has subsided, we will clean things up. We do not care about the exchange rate. The prime objective of monetary policy is low and stable CPI inflation. We recognise that a central bank with discretion but not rules is impotent. MIT and Yale teach Kydland and Prescott. We will replace this mess by a framework. In my reckoning, today's monetary policy statement has failed to clarify objectives, instruments and operating procedure. As I read the statement, I could not understand whether this was a tightening or an easing. I spoke with veterans on the bond market and they were also fumbling. By the evening, it looked like the 91 day T-bill rate (one important summary statistic about the money market) had gone down by 20 bps, but the overnight interest rate swap (another important summary statistic about the money market) had gone up by 15 bps. Only late in the evening, I started thinking that it is an easing. The short end of the yield curve has gone down by 20 to 40 basis points. Some say that there is method in this madness, that an enormously complicated scheme is in motion which will make the world a nice place. But if a layman like me cannot understand the strategy that is now in motion, the fault lies in the statement. The statement says that exchange rate volatility continues to be an objective at RBI: The timing and direction of further actions on exceptional measures will be contingent upon exchange market stability, and can be two-way. Further actions need not be announced only on policy dates.. I think this is a mistake. The only piece of sound macro policy in India today is the floating exchange rate. When RBI pursues exchange rate objectives (in whatever form), this leads to trouble. And, this immediately begs the question: What is your objective? Are you targeting a specific exchange rate? Do you consider INR/USD volatility of over 15% annualised to be too high or too low? What statistical procedure will you use to measure volatility? The moment you try to answer these questions, you realise that the exchange rate is a bad objective. And, until the objectives are precisely stated, there is no monetary policy framework (RBI can hit the economy at random dates with random actions because they have committed themselves to nothing). There is also a loss of accountability which is the breeding ground for failure. There is talk about both WPI and CPI. So the old confusion about the target continues. No serious economist thinks the WPI is a price index, so this talk reduces respect. There was talk about a WPI target of 6\%. This suggests all is well, for WPI inflation is already there. Another disappointing thing that was made clear in the press conference was that capital controls will continue to be used. This is a mistake. In India, capital controls are not an effective tool for macroeconomic policy. Each attempt at doing this is going to roil the markets. Far from saying that the messy defence of the rupee will be rapidly unwound, we are left worried that over the coming three years, in which QE will unwind, we will continue to have a messy framework. Compare and contrast the press conference by Bernanke -- link -- which is a masterpiece of clarity, against what we got from RBI today -- link. The statement should have aimed to clarify objectives, instruments, and operating procedures. It has just intensified the muddle. And since the muddle -- the lack of confidence in the macro framework -- is India's primary problem, it just made India's problems worse. 1).Hats off to you Sir for writing such a brilliant piece on RBI's muddied thinking. 2). RBI says tight liquidity conditions will continue until the current account deficit is brought under control. Can RBI control CAD by raising interest rates? I'm clueless. 3). I cant' understand how RBI can control inflation under the given circumstances when government's fiscal profligacy continues and no attempt is made by the government to ease supply side bottlenecks? 4). Despite following a tight money policy for several years by RBI, it's not in a position to tame inflationary expectations. Then why do they follow such a hawkish policy? 5). Please share you thoughts. If there are supply side bottlenecks causing inflation, then isn't alleviating them a precondition to easing? Otherwise we are just going to stoke inflation even more. What is the point of doing that? In other words, instead of blaming the RBI for keeping money tight, why don't we see it as a problem imposed by the govt's policies on the RBI. The govt needs to get moving on those supply side bottlenecks. Or, else we won't have any growth, which is the case today (actually for the last few years). There seems to be some sort of perverted thinking that if the RBI eases, investment will go into alleviating the supply side bottlenecks. But, I think that is a dubious assumption. The money is more likely to end up chasing speculative investments because the bottlenecks are due to bad govt policies. Monetary policy cannot fix bad govt policies with easy money. Sure, we can get a higher growth number, but its quality will be poor and we risk higher inflation and further unhinging of fundamentals. Bottomline: if we are unwilling to assign the responsibility of inflation on the central bank (and give it the tools and power for that to happen), let us stop assigning the responsibility of growth to the central bank as well. Its only fair. By the way, credit growth in the economy is at 18%, which is outpacing GDP growth by plenty. Is this really tight money policy? There is contradiction in what you are saying. How can monetary tightening be a solution to inflation if it is caused by supply bottlenecks? Agreed, the supply bottlenecks have to be removed by the Government, but RBI cannot take an adversarial position vis-a-vis Government and say that since you are not removing supply bottlenecks, we will not ease monetary policy. This is not the question of blame-game and fixing responsibility. The question is what should the RBI anchor its monetary stance to? It could be core inflation targeting price rise in commodities caused by increase in aggregate demand. You should also understand that 18% credit growth takes into account not only GDP growth - current and potential - but also the inflation rate and the monetisation of the non-monetised sector. When referring to credit growth outpacing GDP, I was thinking of nominal GDP. The main point was, do you think 18% corresponds with tight monetary policy? I didn't understand where you see a contradiction. I was suggesting the risk of "higher" inflation and unhinging inflation expectations with -ve real rates? 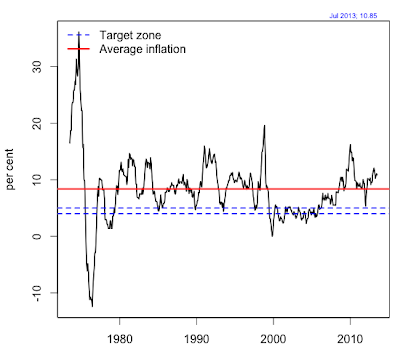 1) There is a real constraint on monetary policy based on CPI inflation that cannot be ignored, regardless of OP and your views on the source of inflation (which I don't necessarily agree with, but lets assume that is true). High CPI has implications for wage/services inflation, savings, etc. Do you disagree with this? 3) Furthermore, looser monetary policy might not give us the investment we need in the right areas that need more capacity, as the bottleneck is not that of more credit but that of better policies. Is that false? My point is that if we make the assumptions that OP and you make, it still does not follow that rates should be lower. I'm not an economist, but questions 2 and 3 make more sense to me as follow ups from OP and your assumptions. Taking an adversarial position for the sake of doing so would be stupid. And, while a blame game is pointless, fixing responsibility isn't a bad thing. Actually, it is sorely needed, at the moment, from a constructive point of identifying next steps. Obviously the policy measure needs to be clarified. And, the Urijit Patel committee will look into the right measures and targets for monetary policy. Lets hope there is clarity after that process is completed. But, whatever it is, I don't see how it can exclude consumer components which encompass wage and services inflation and a way to influence savings and investment trends. The basis of all your arguments is that the credit growth is 18%. To the best of my knowledge it is around 13%. And, it was 17% and, 16.6 for the prior periods, so its been on an uptrend. Before the policy announcement, I heard SBI chairman Pratip Chaudhuri say on Bloomberg that he is seeing credit growth in the low 20s and after the policy announcement he said he expects similar growth (link below), although he did point out various other issues. But, it doesn't look like he was bothered about the repo rate hike. I was commenting on the general argument that is trotted out on inflation and supply side, etc, and not specifically on the latest policy decisions which are muddied by the misguided defense of the rupee. Excellent piece Dr Ajay Shah as always.RBI always thinks, it is the best and knows all the answers. Raising of interest rates at this time will not be conducive to revive growth.Its time, they have wider consultations and respond. Anchoring monetary policy to consumer inflation is fraught with operational difficulties in India. Our foodgrain prices are largely decided by the MSPs, the vegetable and fruit prices are highly volatile because of seasonality and disruptions in transportation. The CPIs in India has about 50% weight for food articles and products. How can monetary policy target food inflation in such a situation? The same is true of Petroleum, fuel and electricity. The prices are administered or influenced by NYMEX or ICE. Allowing pass-through is better solution to contain aggregate demand rather than tightening monetary policy. 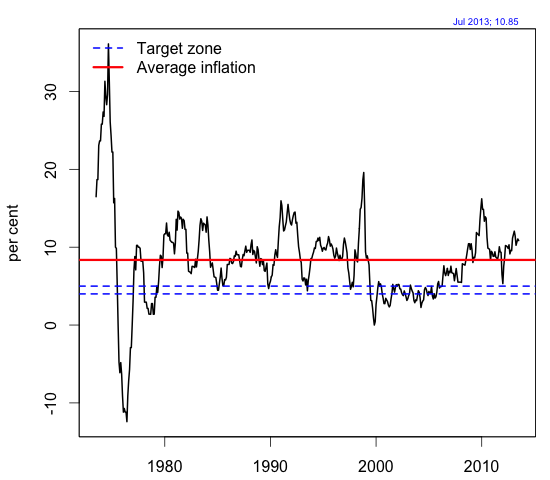 Do we take core inflation as the target? Second, we have too many CPIs. Some are sectoral, like IW, AL and RL. Their base is very old and the basket of commodities and services covered by them does not reflect the current or recent consumption basket of average consumer. The CPI(New Series) is too new; it does not even put the sub-group level indices in public domain. The manner in which the IIP and even GDP numbers are drastically revised does not bode well for the credibility of the CSO. Third, one can anticipate banks trying to breach the professional ethics of the babus if the price index of only one organisation was used as anchor. We could move towards the theoretical ideal of one anchor as the situation on ground changes. I am nobody to question the wisdom of the market. But I fail to understand what has changed so fundamentally that the Rupee made U turn so much in advance of the announcement of Bernanke that the QE3 taper is postponed. I do not consider it a blasphemy to question the belief that markets are always sacrosanct, and honest messengers and guides for policy actions. Volatility is the message. The message is that the currency of a billion people behaves like a penny stock - up a lot on good news and down a lot on bad news. The implications are obvious. Oh and markets can be wrong. But, the point is that free markets are better than anything else we know. Its no laughing matter when upwards of $70 billion is being traded daily in the rupee market. You did not understand that? Neither did I....Exactly Ajay - I don't know what he is trying to achieve. This is what i also highlighted in my blog as soon as the policy was announced by yesterday. He should understand, he cannot eat the cake as well as have it too. If he feels it is highly necessary to tighten the money supply and increase the interest, he should do it whole heartedly. Not like this. Can you throw some light on difference between borrowing under MSF and LAF-repo? Apart from the fact that under MSF the banks can pledge government securities within the SLR while in LAF-repo pledging of government securities over and above the SLR requirements can be done. And how is the liquidity being increased in the market with increase in repo but decline in MSF? Was the goal to flatten the yield curve? Reduce short term rates (via MSF cut) and increase longer term rates via the repo rate hike, which is seen as more permanent. We currently have an inverted yield curve. We usually have had a flat curve. In the US, a persistent inverted yield curve has always forecast a recession and every recession has had an inverted yield curve prior to its onset. So, it has a 100% record. I don't know if we satisfy the condition of "persistent" as yet, but it will be interesting to see if the inverted yield curve in India has similar implications. And, if Rajan is trying to avoid the "persistence" of an inverted curve by flattening it out. I forgot to point out that the 10 year treasury rate increased by 37 bps, more than the 25bps repo rate hike. So, it seems the market took the message that we might get more repo hikes down the line. Net effect of policy was to steepen the yield curve. Whether or not the yield curve has similar significance in the Indian bond market (as in developed markets) is a separate issue. I think banks would like the narrowing of the difference between MSF rate and longer term treasuries. The aim of both Repo and MSF is to target short end of yield curve, let us say over-night borrowing cost. Increase in MSF by 200 basis points without any increase in repo rate had reduced the efficacy of repo rate as the operational policy rate.Reducing MSF rate only by 150 points and raising repo rate by 25 basis points is movement in the direction of restoring the status of repo rate as the policy rate and signalling at the same time that inflation and the currency problems have not gone away. Reduction in MSF rate is a correction of short-term abberation in policy action to prevent excessive speculation and over-shooting in the forex market. The correction has been made in an orderly manner. It is predictable that the RBI would restore the 100 basis points spread sooner than later. There is no confusion or uncertainty in my mind as to what RBI is aiming to achieve. There can be difference of opinion whether this is what RBI should be aiming at. Please note monetary policy cannot solve all ills. The tragic state of the government and Governance has a lot to do with this. I wonder how responsible a FICCI or CII is hen they cheerleader rate cuts and offer that as a panacea. If the currency is not targeted and held to reduced volatility no one will wish to invest. We/still need external capital. Unless we stop wasting resources on the govt policies(10pct deafness allowance, babus going out for medical treatment) we have little hope. Inflation hurts the weakest on society . Also it is sad that after 60 odd years of independence our thought leaders and industrialists can only talk about short term policies. The RBI is the last and only bastion of anything sane in this otherwise corrupt nation. India was never shining ! Two recurring themes in this discussion are `supply constraints' and the role of fiscal policy in influencing prices. "Supply bottlenecks" have always been present in India. If so, how did we get price stability for 7 years (1999-2006)? Do we believe that for those 7 years, suddenly, the supply chain in agriculture worked better? On the role of irresponsible fiscal policy: There are lots of things going on in the world. E.g. there can be an oil shock or a big exchange rate depreciation or loose fiscal policy etc. The job of the CB is to take all those into account and deliver low and stable prices. There is no excuse for failure on the core task of the CB. Do you seriously think that aggregate inflation is not influenced by monetary policy? If monetary policy could influence aggregate prices in Zimbabwe, do you think it cannot do this in India? A CB staffperson who says the CB cannot deliver price stability is like a policeman who says he cannot deliver law and order. He should immediately resign. If you can't do the job, get out of the way, someone else can. Thank you Dr. Ajay Shah for helping us lay people try to make sense of the monetary policy. Everyone remembers Dr. Rajan's Facebook 'like' comment. However at the same time Dr. Rajan had refused to answer most questions from the press with a mysterious, 'wait for the monetary policy'. How many of those questions now stand answered in the light minor tweaking to 3 of the 8 rate indicators? The effective policy rate is 9.5%. How much more you want it to be raised to reduce inflation in rice, wheat, onion (vegetables) and fish? What will be its implications for bond market and financial health of our banking sector? The MSF hike wasn't done to fight inflation and was meant to be temporary and it is not something that the professor supported (the rupee defense), in case you didn't notice. The MSF hike's effect wouldn't even be visible yet, as it takes longer for interest rates to have its effect on macro indicators like inflation. Its not just about the absolute level of the rates. And, your questions actually need to be answered by RBI. This post does not say that rates should be higher, but that there be clarity and credibility. There is a question mark on the RBI's policies, which limits the effect its actions have on markets. It would be educational to review how past central bankers (especially the ones who did well) handled similar inflation situations as well as how other countries with similar inflation situations deal with the problems, and while having similar constraints. Your questions are valid ones, but unnecessary as no one is asking for other issues to be ignored. In fact, the question to add is what does elevated inflation do to the health of the economy? The RBI is doing a review of banks and must issue statements about the state of the banking sector. If the situation is dire, the policy must be appropriate as well. But, that's part of the criticism. Do we feel confident that RBI as an institution can handle bank regulation properly, when it can't handle inflation or simple derivatives regulation? That is the crux of the issue - the title of this post. Actually, if you care so much for the bond market and health of the banking sector, you must be very dismayed by the RBI so far. No interest rate derivatives, no credit default swaps, miserable liquidity and depth in the bond market. Certainly, the RBI has failed to develop a thriving bond market? And, Rajan announced that they have set up a committee to look into bank NPAs, so RBI is behind the curve? Isn't it? Sir..lets do a bit of role playing..Dr Ajay Shah, as RBI Governor on September 20,2013 , what would have been his monetary policy prescription ? Read the section in the post: "What we needed to say"
I see the subtext in the mid-quarter review as twofold. One, the RBI has provided for credit through the MSF rate channel. This also because the exchange rate issue has stabilized recently. And two, it has still maintained that inflation IS a pressing problem, the current rate is not in any way comfortable to the RBI, and hence the rate hike. Please correct me if I'm wrong. The comments to the Firstpost article and here are extremely annoying. Almost all of them are pointing out this specific policy decision and whether or not it makes sense in an isolated, standalone context. However, this post is about the processes, framework, philosophies behind policy decisions in general with this decision being one instance under the larger context. It seems people in India have severe comprehension problems. Can't they see that this post is not about this specific policy decision or about inflation today, but it is taking a step back and asking the question: what is the framework under which the RBI is making decisions and is it a proper, robust framework grounded in proper research and which can handle different problems with a longer term focus instead of arbitrary discretionary decisions and short term policy focus? We don't even have consensus on the objectives of the RBI. It is acknowledged by Rajan to an extent, as he has set up committees to look into some aspects, such as the Urijit Patel committee which will report on what to do about the various inflation measures, etc. Now, since this is something the RBI is working on, why do people find it odd if someone else is pointing out this same lack of clarity? Rajan himself has said that he is not in favor of capital controls but is being less ambitious by leaving the door open on them. The govt has said that they do not have a problem with a weaker rupee but volatility (which is also wrong, but hey, at least its a step better than fixing the rate). Rangarajan, a former RBI governor has said that there are too many policy instruments and we need to get back to one rate. The issues pointed out here.are not controversial. Many of them are work in progress. Now, why would readers not understand the thrust of this post? Its one thing to criticize, but its a totally futile exercise if the criticism is of something that is not the main point of the post.